Yash Gajaria is pleased to represent DECA Ontario as the Events Coordinator for the 2018-2019 year. Yash is a grade 12 student at Rick Hansen Secondary School and has been involved with DECA since grade nine, serving as his chapter president last year. Yash’s life would not be the same without all the amazing people he has met over his three years in DECA. The unique and interesting community that DECA fosters has made the journey so special for him. Aside from DECA, Yash is passionate about financial literacy, as he is the co-founder of Finanza, a youth-led startup which aims to educate Canadian children about financial concepts. He loves volunteering his time and giving back to his local community through his involvement with WE Charity’s Mississauga chapter and the Red Cross Peel youth council. Yash is also working with the Ministry of Education’s Student Advisory Council to improve education in schools all across Ontario. Inside of school, he is an executive on his school’s investors club and is a Link Crew Leader who helps grade nines transition to high school. In Yash’s spare time you can find him playing hockey, tennis or simply enjoying the outdoors. 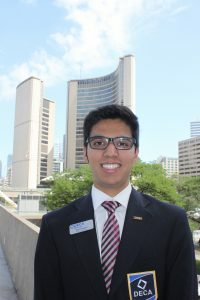 Yash is looking forward to connecting with all the members and is excited to make DECA Ontario’s 40th year a memorable one! If you ever have any questions, comments, or concerns, or simply just want to talk, feel free to reach out to him through any social media platforms or at yash@deca.ca.